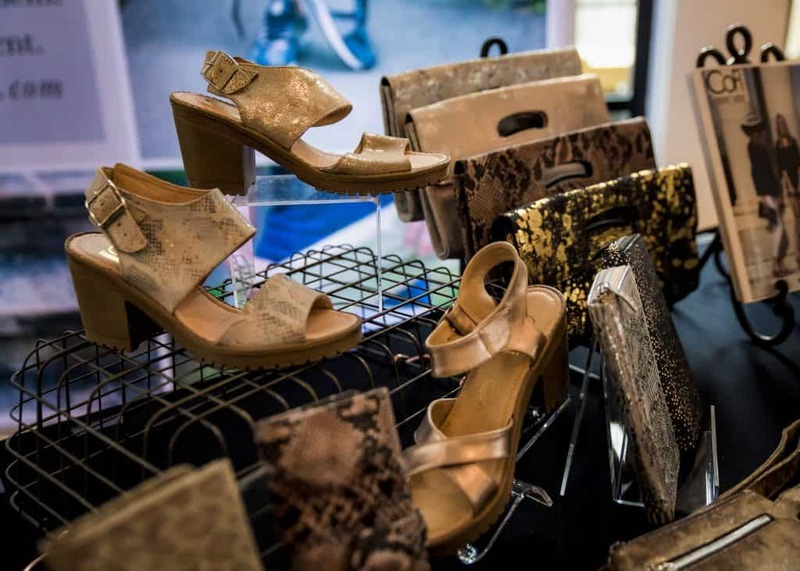 Fashion Mingle was introduced to four emerging fashion brands you’ll want to know about at September’s Nolcha Media Lounge, held every season of New York Fashion Week. 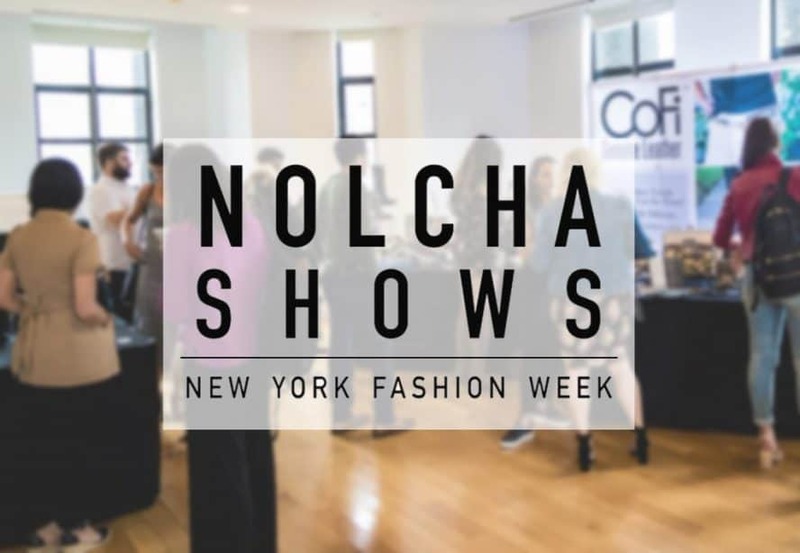 Nolcha is an award-winning fashion events production company that produces product launches, fashion shows, pop up shops, and more for independent fashion brands. 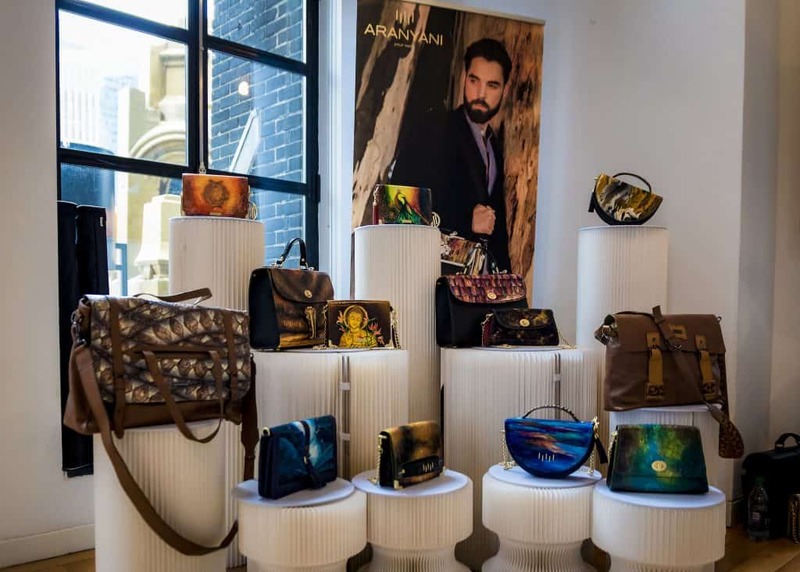 We interviewed CoFi Genuine Leather, Gena Myint Jewelry, handbag line ARANYANI, and ALL BLACK, a Taiwanese Footwear Brand. 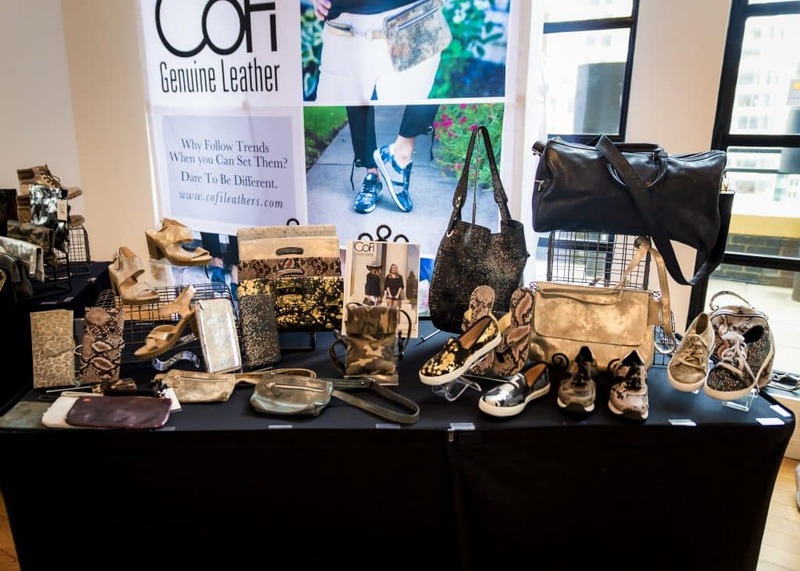 Fashion Mingle: What is CoFi all about and how long have you been up and running? 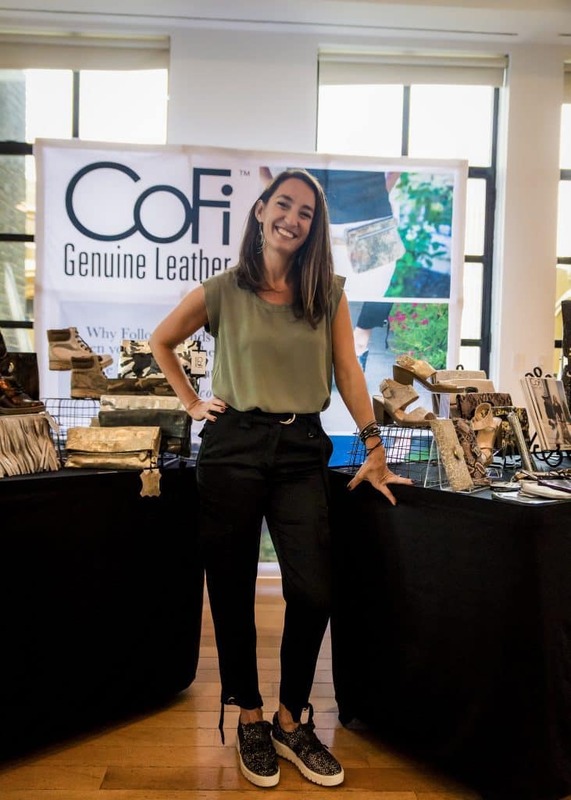 Stephanie McTigue: Cofi is really a family business, my dad’s been in the leather business for 45 years, and we named it after my kids Colson and Fin. My dad and my husband were going to start a company together doing iPad cases and I was taking over the operations of that business and it morphed into a fashion company. Now I own the business and sort of run things. As for the products, we met a gentleman in Mexico who manufacturers these really fun hand painted leathers, and we use Italian papers and foils in a transfer process to custom create our own leathers. And boutiques choose from the leathers that we have to apply to any of the products that we have to custom create a line for their stores. We’re in about 160 stores across the US, and it just continues to grow. FM: Where did your big break come from? 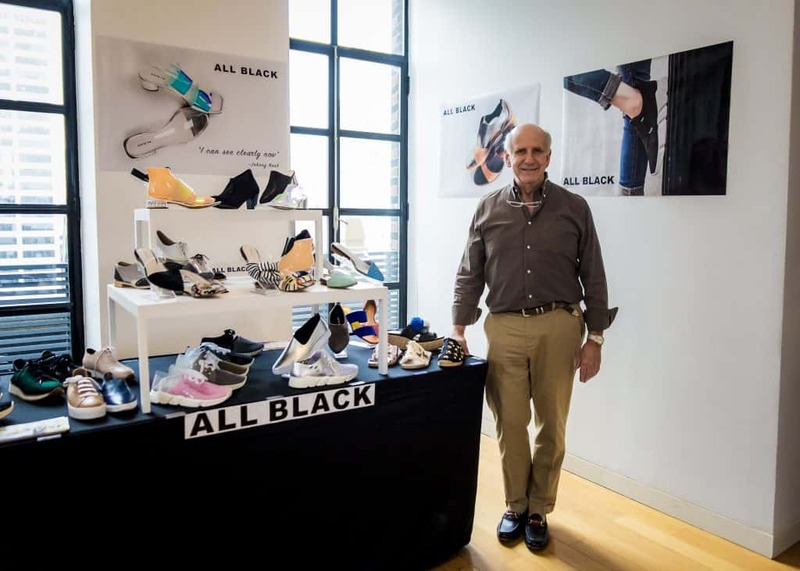 SM: It’s sort of hard to say, I started doing the Vegas show in twice a year, it’s part of UBM Fashion, and that was sort of the first kick off point where people really reacted positively to the product line and I knew, “Ok I sort of have something special here” then that sort of continued to develop and grow. FM: Do you have a favorite piece? If so, what’s the story behind it? SM: There are stories behind lots of the pieces, each one is named after my nieces or friends of mine which is sort of the fun element. This is called the Molly, it’s a cross body and it was one of the first ones that I made and it’s a funny story, when my niece heard that it was named after her, she said “oh my gosh mom, I’m famous,” it was really cute since she was only nine at the time. FM: What are your chief responsibilities in your business? SM: Since I own and run the company I do a little bit of everything and I have my hands in everything. I’ve sort of slowly started peeling off some of those responsibilities to other people that are being brought in. When it comes down to [what I do] marketing, design, sales, public relations, I juggle a lot of hats. FM: Do you have any advice for aspiring accessory designers? SM: There’s a few things I would say: one is to just jump right in and start and to do it. I think some people think they have to sit back and that they’re gonna create this whole business plan, but it never really goes exactly has you hope. There’s some organic growth that happens, you need to be willing to take a risk, make a mistake and change. And be really transparent and consider things that did and didn’t work for you to make it better and continue to grow that way. Try to get your feet wet, you know there’s a lot of things I didn’t know coming in, and I just jumped in and tried it, and I think you need to take that risk and learn from the mistakes, and move forward and don’t really look back. Designer Gena Myint Photographed by Santino Holnagel. FM: Tell us about Gena Myint. What was your brand journey like? 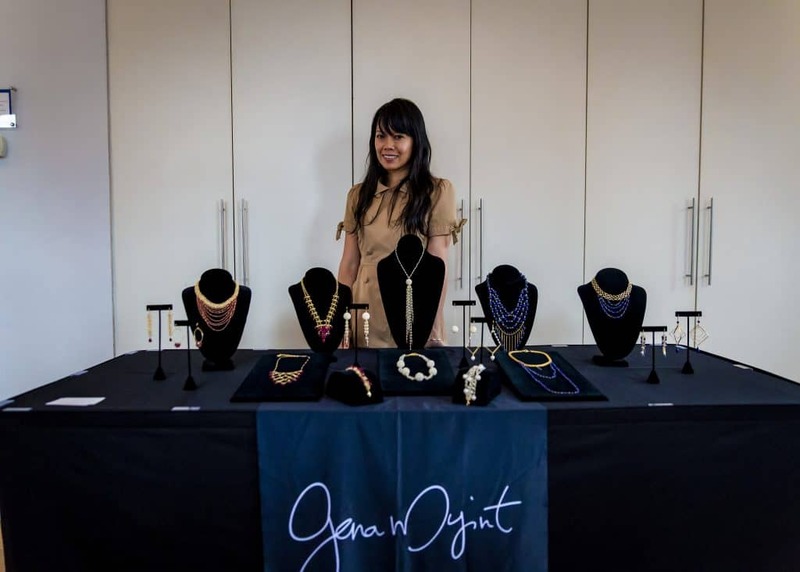 Gena Myint: I worked for a company as a designer for 10 years and I decided to branch out, so that was my big break [from that]. I left because I wanted to something more challenging, there was no room for growth at that company and I was craving a challenge and the first couple of years were very difficult. It’s like a complete change of everything, and as a business owner you take on everything, because it’s your baby, you know? So the first couple of years on my own, I was unorganized and I didn’t have the idea, but now I’m on the right track. FM: Tell about the pieces you have on display here at the NOLCHA lounge, what inspired them? GM: I have three power groups: Rubies, freshwater pearls and lapis, and they were inspired by travel, my hiking, and people watching. Sometimes I’ll just people watch and get inspired by someone’s hair or their shoes or accessories, even the way they wear something triggers an idea sometimes. Or even the way they hold their coffee will strike an idea for me, it’s really interesting. FM: Do you have to work with service providers, and/or where do you source your materials from? GM: I have a handful of stone providers, and sometimes I give them a spec sheet of size, shape and dimension of a bead that I’d like and I have them custom made. I find it more special that way, it changes the whole look. Gena Myint Photographed by Santino Holnagel. 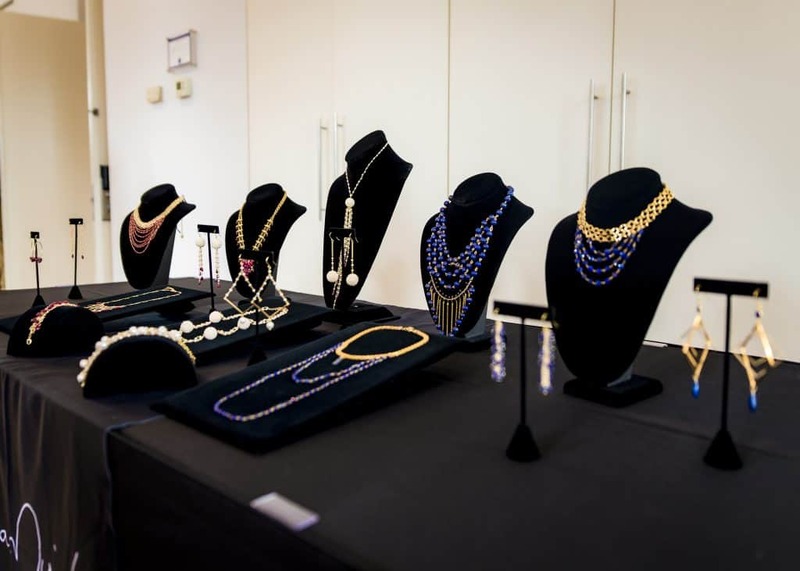 FM: Do you have a favorite piece in the collection? GM: This piece (pictured above) reminds me of the waterfall in the catskills. 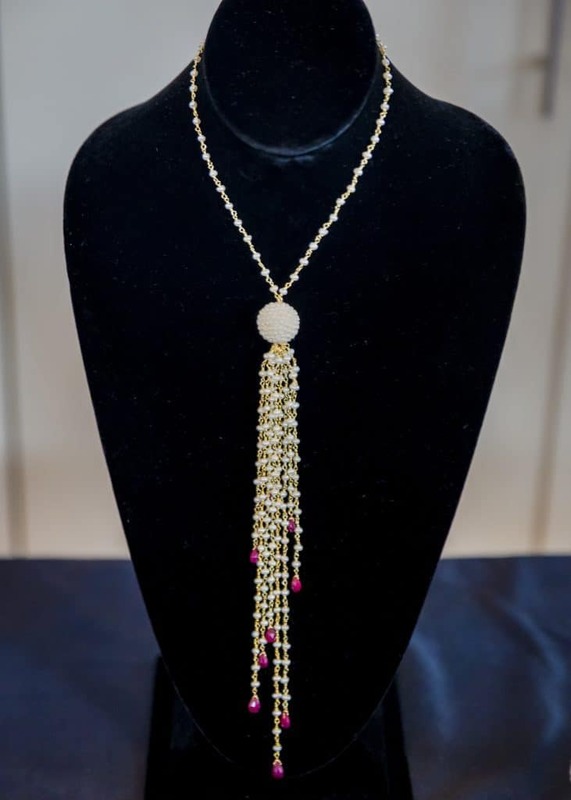 Pearls are a classic and you can wear them with just about anything, and plus I love a good ruby and pearl combination. FM: Do you have any upcoming exciting news for your brand? GM: I’m always having fun with what I create, I don’t have a specific way of coming up with ideas, they just come to me, even if I were to think of one design, it sometimes becomes something totally different. 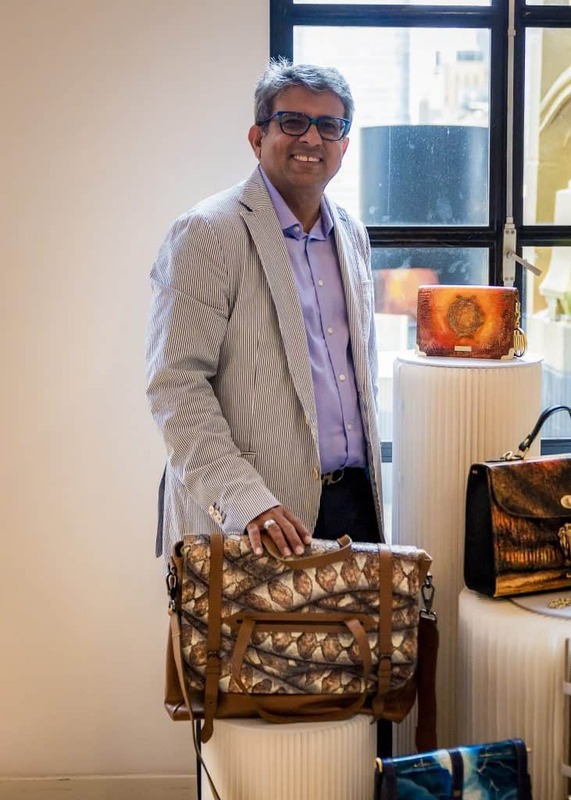 Haresh Mirpuri Brand Founder of ARANYANI Photographed by Santino Holnagel. 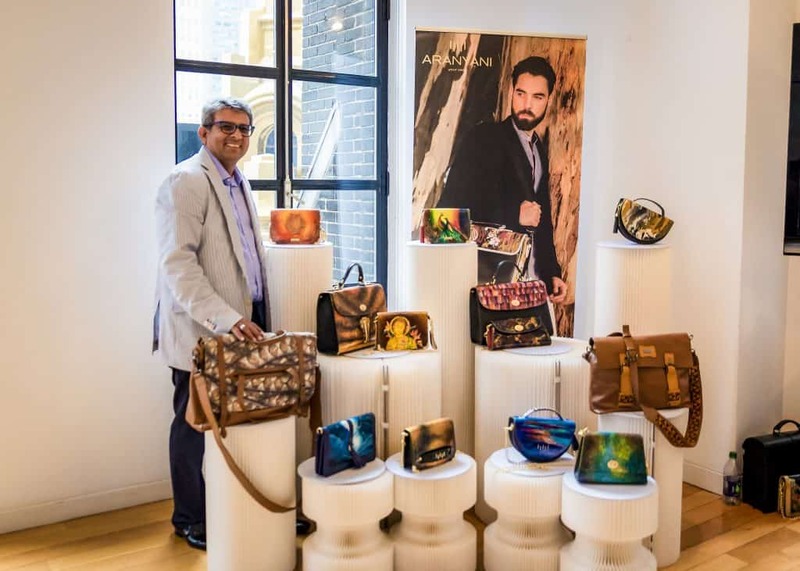 Fashion Mingle: The collection “Finding Your Roots” is inspired by nature, and all of the bags are hand painted. Can you tell us about the sustainable element of your brand? Haresh Mirpuri: One of the most important things we do is train young artists, and we have a trainer who comes was [previously] the Gucci technologist, Rafael Lombardo, and we train with other professional artists. The art is representing our culture, and so we encourage that in the community and that is why we don’t have one single designer in Aranyani, it’s a collaboration of many brains put together. We also built music into it, so young musicians are also taught, and we use dance in the collaborative presentation, so we use all art forms. FM: Do you have a favorite piece? ARANYANI Photographed by Santino Holnagel. FM: What advice do you have for aspiring designers? HM:Every designer needs to have full faith in what they want to pursue and remember, we do not inherit this earth from our ancestors, but we are borrowing it from our children. So designers must ensure that we take the responsibility for sustaining this earth as well. We need to start being more aware of that. FM: Any upcoming exciting news for Aranyani? HM: We’re coming out with an intelligent bag which uses artificial intelligence, and we’re hoping to showcase that in February during Fashion Week, we consider that an art in the modern technology format, so we’re really looking forward to that. ALL BLACK U.S. Brand representative Marty Rose, Photographed by Santino Holnagel. Fashion Mingle: What’s the most exciting part of the SS19 Shoe collection? 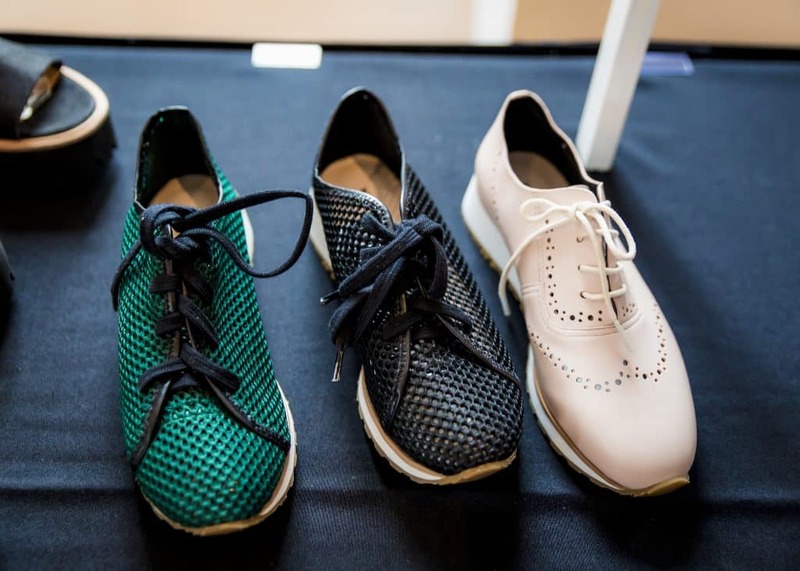 Marty Rose: We worked in a new element that we call plastic, one is the edgy female, one is the fashion sneaker and we were able to put the plastic in those styles, and we made it for varying tastes. Someone who wants an aggressive look would take a pair with all plastic and someone who only wants a hint of it would go with less plastic. So the plastic is a key element for spring. Also important to our new collection is fish skin. We take tilapia fish skin and back it with pig skin, then we dye it and it becomes a different element than snake skin, for example, because it has more texture. And we’re using a new mesh material, it’s an exclusive for us, we’re the only ones to have it, and it’s very soft, and they have been received very well. ALL BLACK Show Designs, Photographed by Santino Holnagel. FM: How do you source the fish scales? 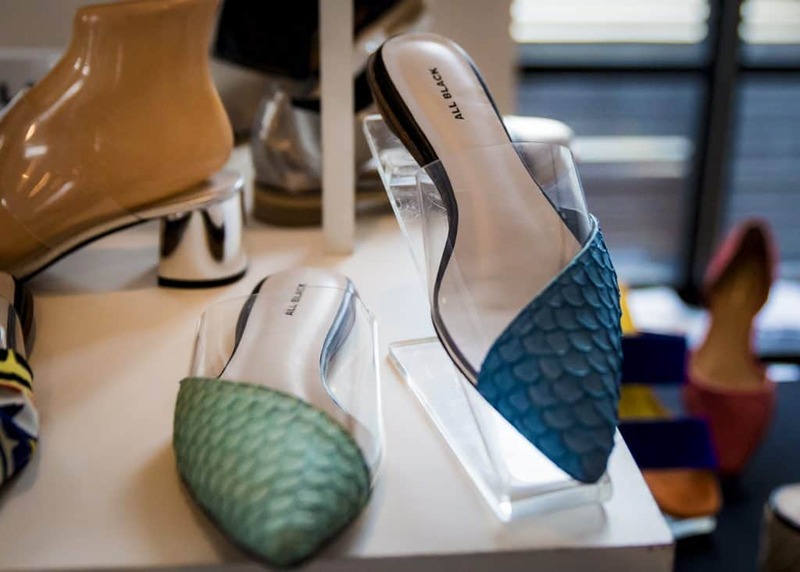 MR: It comes from Korea or Taiwan, we go to the actual fisheries that harvest the Tilapia fish, after they harvest and take the meat out, and rather than getting rid of the skin, we recycle it and use it for the shoes. FM: Where did you turn to for inspiration? MR: Our team works with the designer and gives her additional info to help round out the inspiration process. She’s the visionary, but she needs trend info, so I put her onto trends. For example, when denim was hot, we mentioned you need to have denim in the collection when the block heel became the heel to have, we made versions of that as well. Then she came up with the reflection/holographic style and she came up with the woven leather material, which she’s also going to put on heels. FM: Any upcoming exciting news for ALL BLACK? MR: Our biggest deal is we’re doing our own website for the first time, so we’re excited to sell directly to our customers and for direct feedback from our customers. We get inspired from our customers. Sofia Villarreal is a digital marketing specialist with several years experience in public relations, fashion editorial, social media management and brand strategy. She is best at helping brands define their voice to communicate their stories with strategic and dynamic methods. She loves reading and writing about fashion, and she is a native Texan who looks forward to relocating and expanding her experience in New York this fall.